License Manager is a tool that allows you to add SDK license keys or manage added licenses. You can also add and manage cloud license keys for leveraging cloud recognition feature with the License Manager. After you select the license that you want to add, provide the App name and the App ID for identification. ※ App ID refers to Apple's Bundle ID and Android's Package Name that you enter when distributing the app. ※ App ID cannot be modified later. Please check for any typo before entering the ID. 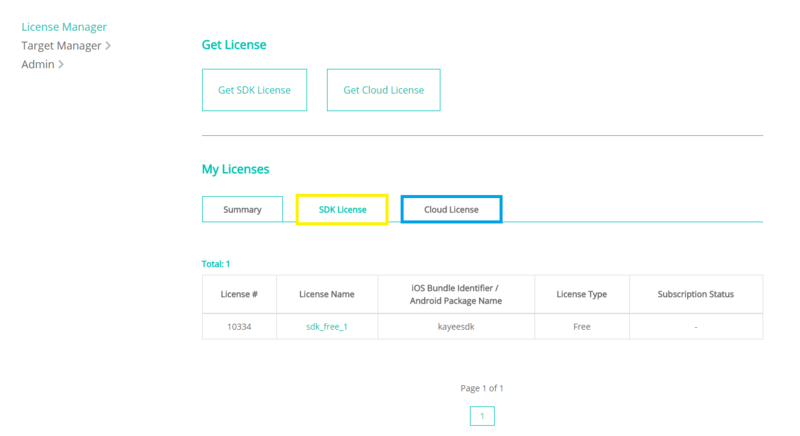 In the SDK License list, select the name of the app with the license you want to check, including the license keys. On the License Details screen, you can see the license type, first registration date, next billing date, payment method, subscription status, and license keys for each version of the SDK. Please select the preferred SDK version. The license keys for that SDK version appear in the text field. When you click the Copy button, the license key of the selected version is copied to the clipboard. Free and Pro-One Time Fee licenses can be upgraded to Pro-Subscription license by simply clicking the Add button in the License Type. If you have Pro-subscription license paid by Inisis, you can extend the subscription period with the Extend button in the License Type. For the Pro-Subscription licenses, you can cancel your subscription within the subscription period. If you cancel the subscription, the SDK updates after the point at which you canceled the subscription will not be supported. You can delete the licenses that you no longer want to use. Once deleted, the license will not be restored and it will be permanently deleted from the license list. Select the desired cloud license and type in the license name. Select the license name from the Cloud License list. You can check the number of recognition per month, the number of target images uploaded, and the payment history for each license. Trial licenses are automatically deleted after one month of the free trial period, and the target group associated with the license is also deleted one month after the expiration. Your Cloud Pro license allows you to add the number of recognition. By selecting the Add button, you can add the necessary number of recognitions in 10,000 units for the month and pay the corresponding fee. ※ The renewed number of image recognition will not be carried over to the next month even if they are not exhausted in a month. ※ The number of recognition signifies the number of times that the recognition has been attempted, regardless of whether recognition succeeded or failed.